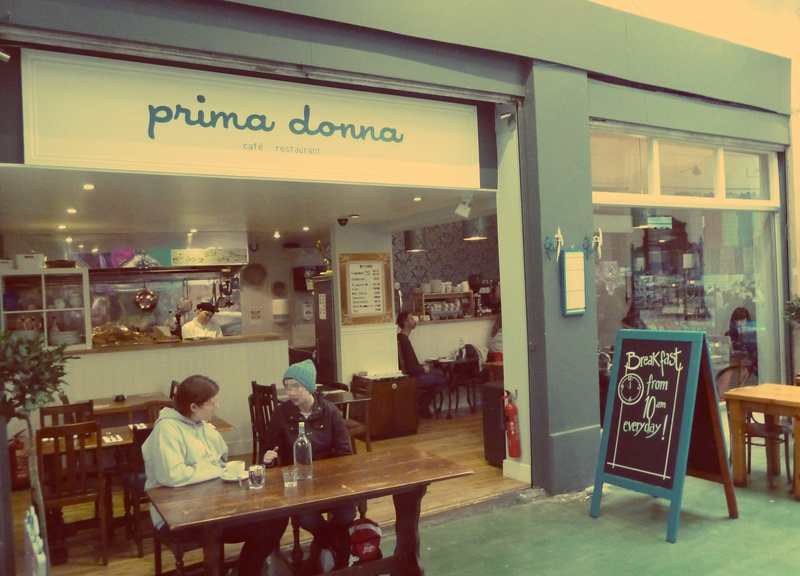 This is formally Prima Donna and has now become definitely authentic Brazilian so it now has a USP (unique selling point). It is open for breakfast, lunch and dinner and not much has changed except the menu since its earlier incarnation. There are a few tables inside and they are not crowded together so you can hear yourself think above the music – much more Brazilian than previously. There are also tables in the market corridor. I never wanted to start a review with the sentence ‘The problem with this restaurant is…’ but I don’t feel creative enough to say it another way. So … the problem with this restaurant is its USP (unique selling point). It has an Italian name, a Portuguese/Brazilian style of food at dinner and it plays music from Radio 1. Described as an cafe/restaurant the breakfast menu looks English yet lunch seems to be more Brazilian. I quite like novelty but this is so eclectic that may be difficult for passers by to understand (and be drawn to) its open doors. This is a shame as it probably deserves encouragement. 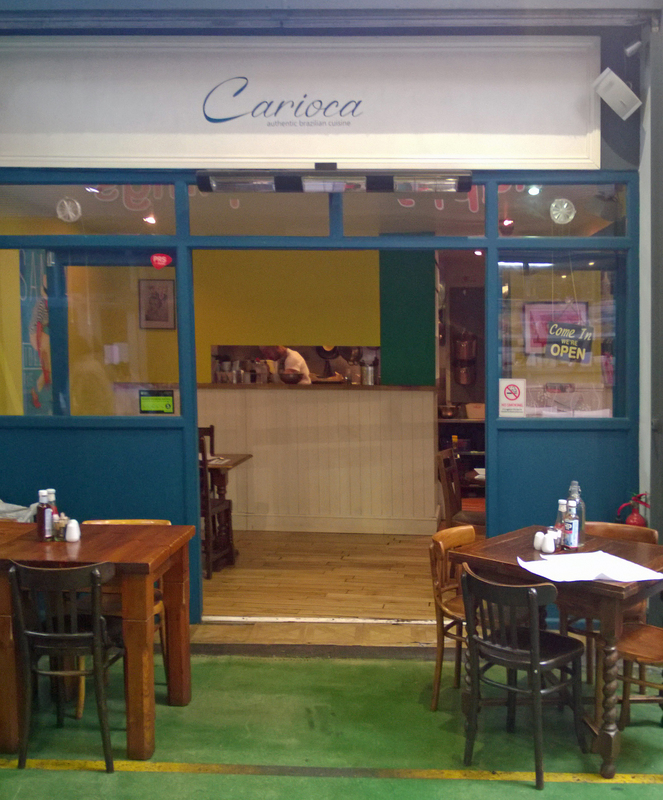 This is a new restaurant in Market Row rather than in Brixton Village and it builds a new epicurean alleyway particularly as the Village is getting fuller and fuller and hard for the casual visitor to be sure of getting fed. Small tables (for two) are inside and outside. Its white walls have little adornment (well there isn’t much wall in there) and across the back wall is the kitchen. 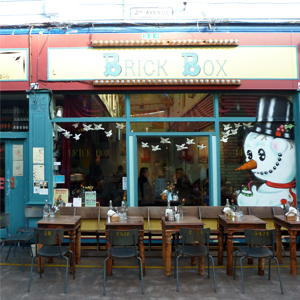 Brick Box, in the heart of Brixton Village, describes itself with some hyperbole as a place for art, love and magic. 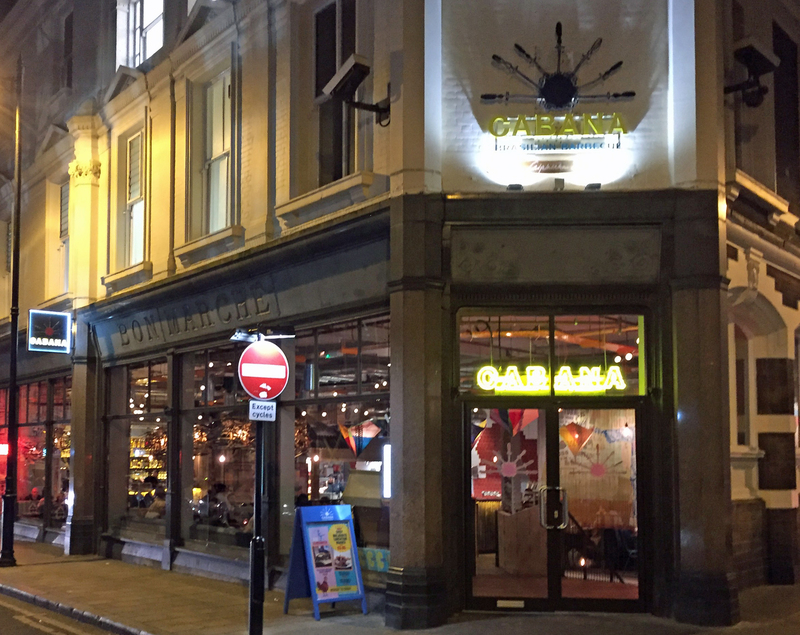 We were not totally convinced; however, it does serve food, so of course we had to review it. With the usual wooden tables and mismatched chairs, it squeezes in tables at angles in the small internal space and outside in the alleyway so it has much seating. It is extremely popular so at 6.45 on a Friday the outside tables were full and we were lucky to even get an inside table. This was in comparison to other restaurants which were relatively empty at that time. One explanation fir this might be the happy hour which starts at 5pm. The venue says it provides for a number of events including screenings, live art (?) and theatre which will be a bit of a coup given the size of the place. Most events seem actually to happen in their Tooting site although the walls are covered with art. 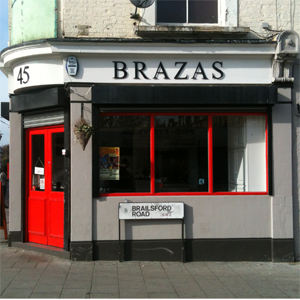 This community arts group have partnered with Senzala in Brixton to provide the food- a range of sweet and savoury crepes and galettes – and of course a fully licensed bar which seemed to be attracting the most custom. We ordered a Caprinha and a lemon daiquiri to get us into the spirit and, sorry but they were both a bit of a disappointment. They were more like alcopops rather than cocktails so we wished we had chosen the wine. The menu comes in two section – the savoury and the sweet crepes. There is some allergy advice on the menu and you can get a wheat, gluten, lactose and egg free gallette which is what we chose. We ordered the Senzala and the Caramelised goat. These were very similar – rocket and cheese (gorgonzola or goat’s cheese), caramelised red onions and mixed herbs with the addition of sun dried tomatoes in the Senzala. They were plump and the gallette was thin and crispy but stuck together enough to allow you to get all the bits into your mouth at the same time. We enjoyed them but we want to point out that if you highlight the caramelised red onions on the menu then they do need to be caramelised and not just a bit sweet and limp. 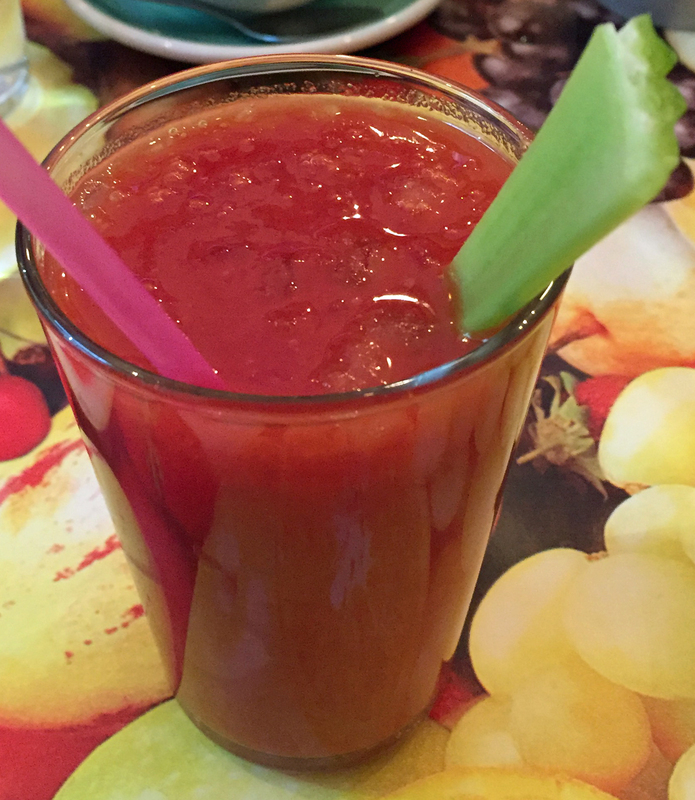 Service was fast for ordering and helpful – pointing out that we should try the homemade chili sauce as we would never have noticed it in the sugar container. A little of it went a long way – but it does add spice to the cheesy mix. We were surprised at how much better the galettes were on this occasion from a previous visit when we had the Spaniard which was a bit limp with too little filling. We didn’t repeat the choice so we can’t verify a change in this one. We didn’t have a sweet crepe but they looked more variable with mixtures of the following ingredients – bananas, nuts, Belgian chocolate (white, milk or dark), rum, coconut, nutella and maple syrup. We just went to Lab G for an ice cream – two pancakes in the same meal definitely seemed one too many. We might go back next time for a cup of tea and a sweet pancake which would make a change from the cupcake offerings in most of the other tea shops in Brixton Village. This is a SouthAmerican restaurant with a very unprepossessing exterior and the interior at first glance looks like a local cafe. But venture further inside and there is a restaurant at the back which is such a surprise. similar to the Tardis it is much bigger than at first glance as the restaurant area runs across two buildings. Argentina is about meat, chargrilled. We chose piri piri chicken and a speciality of Argentina – a stew that had ingredients that no-one now remembers but they did sound exotic. Booking is necessary unless you are there early as it gets very full. We had a main course and then took advantage of the fantasic range of cakes as a takeaway for later. There is a really good selection of cheesecake with imaginative toppings and no-one should pass without taking something home for later. Wine list looked ok – we were on a no alcohol until the weekend so didn’t try it. The menu isn’t cheap but it isn’t outrageous either.